We will match all local competitor’s prices and price guarantees. 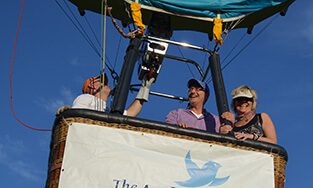 Simon & Carolyn Restell welcome you to the colourful and exciting world of Hot Air Ballooning! Our family business offers local flights as well as private chartered flights. If you’ve been searching for the ultimate gift, then look no further. Flights take place over the most beautiful and tranquil countryside of Southern Ontario. Relax as you float along gently in the breeze. Take in a bird's eye view of the world as you float along in one of the most enjoyable ways to fly. 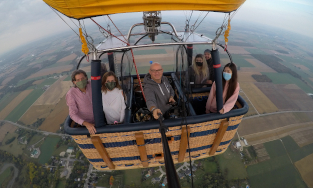 Hot air ballooning is one of the oldest and simplest ways of flying. Every flight is an adventure as you never know exactly where you will land. Fly with a group, or take our sweetheart flight for two for breath-taking views. We offer flights on weekdays, and weekends, in the morning and in the evening. All of our pilots are certified, licensed, and very experienced and skilled.